WHETHER you need a grave dug, tyre fixed, laundry done, or a spare part for your vehicle, the chances are, Rhyna Nicholls can help you. 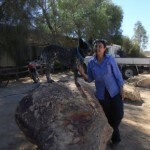 With only seven permanent residents of Innamincka, they all have to be fairly self-sufficient, but Rhyna takes multiskilling to a new level, even by outback standards. 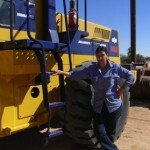 The owner of Innaminka Earthmoving Pty Ltd, she runs the business with just one employee, mechanic Kim Townsend, a Tibooburra-born and bred man who can also turn his hand to fixing or operating pretty much anything. So when the project to deliver geothermal energy to Innamincka kicked off in 2006, it was one of Rhyna’s diggers that turned the first sod. By default, she is also the town undertaker. Visitors to the town are most likely to meet her through her tyre-fixing service or Kim’s gift of bringing any thing mechanical back to life. A side business is the town Laundromat; self service cappuccinos available. ‘Multiskilling is a catchword nowadays, but in the bush we’ve been doing it since we selected the place, because we had to,’ Rhyna says. Making me a coffee in her warehouse-sized open-plan home, she warms to the topic – how Australia is losing its ‘can do’ attitude and bush skills as the rural population declines. ‘My late husband probably had two years of schooling if that – he could barely read and write – but he was an outstanding operator of machinery and ran an outstanding company here in the basin. He carried all his jobs in his head. ‘And my father probably received 18 months of schooling, but ran a very successful fourth-generation property. 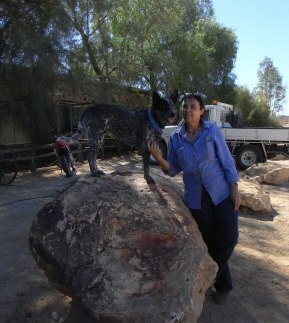 blue heeler called Gem. Getting him to sit up on his haunches on a dining room chair, she pours him a cup of milk which he politely proceeds to lap from the tin mug, paws gently resting on the table. While strong and determined, the trim, nuggety woman has the gentle air of a horse whisperer about her; just as her sun-kissed hands are firm from manual work, but her neatly cut nails carry a hint of pale pink polish. The property her father, Gordon Titmarsh ran – where Rhyna grew up – is Tandora Station, on the Mary River near Maryborough. She describes it as ‘harsh country’ in the salt water section of river, about five miles from its mouth, where the river is about a mile wide. Rhyna was a few years younger than her older brother and sister and had independence thrust on her from an early age. She remembers mustering long-legged Brahman cattle in heavily treed country where they could disappear into the scrub. In more recent photos it has been transformed to English-style parkland, with widely spaced, larger trees offering shade over vast tracts of lush, green grass. Her mother, now 92, still lives on the property, now run by Rhyna’s brother, Lyndsay Titmarsh. ‘Mum a very clever woman and think there was a certain amount of frustration in living in bush in poverty and working behind bullocks. ‘I think she would have preferred to teach – she was certainly pretty tough on us!,’ Rhyna reflects with a laugh. Rhyna did correspondence school to grade 3 then went away to school Maryborough. Although it was not that far away, the roads were poor roads and the family owned no vehicles, so she only came home in the holidays. Sam now does the same; the 18-hour drive from his Brisbane school means he only comes home for the longer breaks. He starts work alongside her as soon as he’s back. Rhyna is immensely proud of him – with good reason. He’s a keen worker, able and willing to help with whatever’s asked of him, and with enough common sense to act on his own initiative as well. Seeing her in her outback element, coping so easily with whatever Australia’s harsh climate and isolation can throw at her, it’s hard to imagine her behind the desk of a bank, but that’s where she started work, after leaving home at 14 and going to live with her sister in Mt Isa. That job was followed by a long stint with the Queensland Police, rising to the rank of senior sergeant. Rhyna was at Ada Vale, Queensland, and her second husband, Ivor Nicholls, was working on the pipeline in Mt Margaret when they met. ‘We said we’d give it [Innamincka] seven years and we’ll see what we can do to build up the machinery, build this place and build the company up,’ she explains. ‘And in the seventh year he died. Ivor died of cancer and Rhyna considers it one of her greatest achievements that she nursed him at home right up until the end. ‘After he was operated on, we closed the business while I nursed him in Adelaide for five months, trying to run business from there. He was diagnosed as palliative in October and died in January 2005. Staying at home was important for Ivor, who Rhyna said had never been in the city in his life until he went to Adelaide for treatment. While the business had been a partnership, it was Ivor who was the machinery expert, and his passing meant Rhyna had to re-think her future. Rhyna dropped the truck and prime mover side of the business, redefined how she worked and what she did and she and Kim decided what they should cut out and a few new areas they could move into. Some new machinery was bought and, as the nation stares down the global financial crisis, she feels she is in a ‘pretty firm position as a company’. ‘We can shut down here for quite a while and survive – we don’t have a whole load over overheads or borrowings. 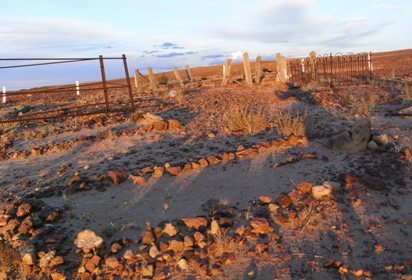 When we started 10-11 years ago we had $70 to our name and a huge tax bill – when we started here [Innamincka] there was no roof, no walls, nothing but open paddocks – there were just coals here where I’d cook for the crew we had,’ she says, pointing to a spot in the middle of the room. Between them they built the workshop, adjoining home, and the company’s business – employing 46 staff at its peak, with a lot of work coming from the nearby Santos oil and gas sites. ‘He was a stone man; he taught me to work stone, and I’m a wood lady so I did all the wood work,’ she says, pointing to stunning timber bench tops made from boards recycled from Santos cast-offs. Caring for the environment comes naturally to most bush folk, she believes, although she admits some of her father’s early conservation work at Tandora Station went against the popular trends of the time and was regarded by some as ‘quackery’. One process Ivor put in practice was scraping aside the top soil and seed before any earthworks began. 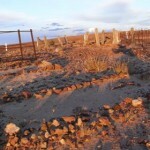 This would then be replaced when the gas work or mining was done. With her long plait of dark hair and trim figure, Rhyna looks at least 10 years younger than her 54 years, but she now is approaching another crossroads; Sam will leave school at the end of this year (2009) and will need to decide if he is interested in taking over the business. There are a couple of changes afoot that should make living and doing business in Innamincka easier – one is the Habaneros geothermal energy project, which will finally bringing power to the community for the first time, and another is the possibility of opening up more of the town for freehold purchase. ‘I still bucket water from the tanks and use generators for power, but that’s what I grew up with. Australians in the last World War were highly sought after because they knew how to look after themselves and convert things to their own use – people can’t work things out for themselves nowadays. They see country life and think it’s all deprivation. In the same way as Innamincka is adapting to meet the emerging future, Rhyna is using her traditional skills to forge a very modern life for herself and those around her. This inspiring woman leaves me with the feeling that it’s a skill combination that would benefit many others. MANSIONS that take up too much room on a block, pollution and affordable housing may sound like modern issues. But a new book compiling the writings of architect Walter Burley Griffin reveals his interest in those topics many decades ago. Much has been written about the American-born architect who had a major influence on adolescent Australia as it struggled to find its own identity in the early 20th century. The solid tome, edited by Griffin’s grand-nephew Dustin Griffin, comprises 71 passages of the architect’s writings on a range of subjects. Apart from designing the nation’s capital city, Canberra, Griffin and his equally creative wife Marion Mahoney designed towns, public buildings, individual homes and a number of residential estates. In the north-west suburbs, Griffin’s work can be seen in the design of Essendon’s Incinerator in Holmes Road, created as a municipal rubbish disposal unit and now converted to a vibrant arts and cultural centre. The layout of part of Avondale Heights was also done by Griffin, originally using similar ideas to those he followed in designing Eaglemont in Melbourne’s north-east. However, the concept of shared neighbourhood gardens was never followed through and most of the open space has since been rezoned as residential, although only two have so far been developed (both for aged-care homes). In Melbourne, his work can be seen at Newman College at Melbourne University, the Capitol Theatre – and a missed opportunity to develop a vision he had for the Jolimont rail lines, a plan that is back on the drawing board. An early student of Frank Lloyd Wright and reader of Rudolph Steiner’s philosophy, Griffin believed strongly that buildings should harmonise with their environment and was keen to use materials and colours that blended with nature. The Writings of Walter Burley Griffin, 512 pages, published by Cambridge University Press Australia; rrp $199. BETTER driving techniques have made great savings for freight company Linfox, putting it well on the way to reaching its goal of cutting greenhouse gas emissions by 15 per cent over three years. Linfox is due to move to its new headquarters in Essendon Fields by March and driver training is one aspect of the transport giant’s wide-ranging plan to cut emissions by 85 per cent of 2006-07 levels by 2010. Its ultimate goal is zero emissions. Initiatives include getting drivers to stick to a “green line” when accelerating, not leaving trucks idling when stopped and smarter planning of pick-up and delivery routes and schedules. “Research has found that eco-driving can deliver up to 20per cent reduction of fuel. We haven’t had that yet but we have seen 10-15 per cent,” environment group manager David McInnes said as he outlined Linfox’s progress at a forum at Victoria University. The company believes it can achieve a 10per cent reduction in emissions without any cost at all. However, the plan includes using more B-Triple trucks to achieve efficiencies of scale, an unpopular move in the past with residents living on or near truck routes. Mr McInnes said “a law according to Linfox” had been laid down to combat employees’ natural resistance to change and scepticism. The “law” recognised climate change was real, that human activities were at least partly to blame, that reducing any form of pollution could only be a good thing and reducing energy use made good business sense. A staff group of “GreenFox environment heroes” had been formed to communicate the message within the company. At Linfox, 80 per cent of emissions come from diesel and 13per cent from electricity, so these are its two main targets. The first step in identifying, measuring and reducing emissions has been achieved by setting up the company’s accounting system so it can monitor emissions from each vehicle, the contract it is responsible to, the customer it has been working for, and the state it has been working in. “From this we can set weekly KPI targets for carbon emissions for individual contracts and we hope to finally get down to setting targets for individual drivers so we can reward improved behaviour,” Mr McInnes said. By pricing emissions per tonne, they could also see the impact of a carbon price, he said. TALKS between the owners of Tullamarine tip, the community and the Environment Protection Authority have broken down, with TPI Cleanaway and the EPA both boycotting meetings. EPA executive director regional services, Bruce Dawson, said before last week’s meeting that the authority would not attend meetings until a new independent facilitator was appointed. On the eve of Tuesday’s meeting, community members of the Tullamarine Rehabilitation Advisory Committee led a protest on the steps of the EPA’s head office in Southbank. Committee member Harry van Moorst said the facilitator resigned in September because she felt she did not have the committee’s full confidence. Mr van Moorst said that information had been requested of the EPA, but it had not been provided and it had been her task to follow this up. Community members believe the type of cap stipulated by the EPA in 2001 is now “third rate” and much higher standards are expected. Mr Dawson said last week its website was being updated, and defended the cap. “EPA is confident that the cap design is in line with best practice. TPI did not return calls by press time. SINCE her latest life-saving operation, Patty Carlyon counts her life in days. When you have been told you are going to die as often as she has, every day is a blessing. Last Wednesday, it had been 168 days since a bone marrow transplant operation – just one of too-many major operations Patty, 11, has endured since being diagnosed with acute myeloid leukaemia in November 2005. Everyone’s hopes were raised when Patty went into remission in mid-2006. Then, last July, her life came crashing down when the leukaemia reappeared. Determined to make the best of the bad news, her family held a huge party and sent her off to hospital in a limousine. “I’m really well now and, if my next tests are good, I’ll be able to go off boiled water. I’m already off the ‘clean’ diet,” she said, referring to a food regime she had been on for months. Her diet had been limited to food prepared within half an hour and boiled water to reduce the risk of food poisoning or bacteria while her immune system was low. Of the past 168 days, about 100 were spent in hospital, so Patty was more than happy to come home in time for Christmas. She still has fortnightly blood transfusions and goes back to hospital for regular tests, adding to the strain on her parents, Kim and Ron, and family. Sibling Elizabeth, 8, sometimes gets fed up with the extra attention Patty receives. Yet it was Elizabeth whose bone marrow was the perfect match for Patty – and she bravely endured the pain and discomfort of donating it. Patty is proud to have played a role in improved treatment of children with leukaemia. Because she suffered massive secondary infections from cold sores when her immune system was destroyed by chemotherapy, patients are now treated for cold sores and urinary tract infections before problems set in. A heart echo test – colloquially called the ‘Patty test’ – is also given after chemotherapy to prevent the massive heart damage that nearly claimed her life three years ago. “She is the first [patient] to show that the heart can heal with the aid of a pacemaker,” Ron said. Not that it was all plain sailing. She contracted a virus and again got a cold sore infection, which spread straight to her kidney, liver and lungs, and almost killed her. She pulled through to keep hold of two other ‘records’: the longest time spent in intensive care (eight months) and the only child to be treated on all eight floor levels at the Royal Children’s Hospital. Patty has spent more time in hospital than at Sunbury Primary School in the past four years. She can rattle off medical terms with ease and has a mature approach to life. For now she keeps counting the days: in 572 days, doctors can be sure her transplant is fully successful. In 1657 days, she will be officially cured. JOE Garra thinks he has the best block of land in Bulla. At night you can see the city lights. By day you can watch the planes fly in and out of Tullamarine. But birdsong is about the loudest noise you’ll hear. That will change when two freeways merge on his land, as VicRoads plans suggest they will in 10 to 20 years. At 55, Mr Garra hopes to have sold off and retired by then – but he believes the value of his St Johns Road land dropped as soon as VicRoads released its route map for the proposed outer west ring road, which appears to go straight through his property. In fact, he may get hit on two fronts, as the ring road appears to merge with a proposed extension to the Tullamarine Freeway on his 52-hectare farm. “As soon as someone sees that on the Section 32 [notice giving property details] they’re not going to want to buy it,” he said. The Elders Real Estate agent knows firsthand what the land was worth. “My neighbour just sold his place for $2.25 million, and that’s for 26 hectares with an older house on. So mine had to be worth at least $2.4 million, and that’s being conservative. Mr Garra said other neighbours planning their dream home would end up with a nightmare. “I sold a house on this street on 15 acres for $950k and the first thing they’ve done is pull it down to build a $500,000 house on it – what will it be worth with a freeway next door? Mr Garra’s neighbour, Cathy Jones, is a third-generation Bulla resident. She’s philosophical but sad about the impact the road will have on her home. “There’s not many places where you can be so close to the city and still in the country. They’ve certainly picked the best land to go through, with the [Wildwood] winery and so on, and there’s nothing on this street that sells for much less than $1 million. Since Ms Jones moved to her six-hectare lifestyle block in 1983 to run horses on the land, the family has strived to improve it. “We’ve worked hard on the weeds – there’s hardly any serrated tussock left on the place – and when I think of the trees I’ve planted and struggled with the drought to keep alive, it’s such a shame. VicRoads has stated on its website that its maps are “schematic” and subject to consultation, but also that: “If your property is within this dotted line it is possible that your property would be affected”. The authority has said that affected landowners will be contacted by mail this month and public meetings held in April, but dates have yet to be set. A VicRoads spokeswoman said it was “too early” to make decisions about land reservation needs. VicRoads has the power to compulsorily purchase land, but this will not happen until an exact route has been planned and the State Government approves the project, not scheduled to happen for many years. In the meantime, Mr Garra thinks it is unlikely he will be able to sell his land. Compensation claims can only be made once the route is confirmed. “They may acquire it in 10 years’ time but the price probably won’t go up in that time,” Mr Garra said. “I emailed VicRoads eight weeks ago. “DOING nothing is not an option.” That is what Macedon MP Joanne Duncan told more than 500 residents who crammed into Sunbury’s Memorial Hall to discuss electrification of the rail line last Tuesday. “Failure to tackle the problem now means busy rail lines will ‘hit the wall’,” she said. Combined with expert opinion that electrification is the best way to solve the Sunbury line’s rail problems, it is the closest the State Government has come to declaring the plan will go ahead, despite public opposition. The vocal crowd loudly decried those defending the plans and cheered any criticism of the Connex train service. They overwhelmingly approved a motion drafted by Sunbury Residents Association, which organised the meeting, demanding the State Government drop the $270million project and spend the money increasing the train line’s capacity instead. A few spoke in favour of electrification. “When governments make decisions about infrastructure they don’t often do it by a plebiscite or poll,” Ms Duncan replied. Several people left the meeting as a result. A rail expert advising the Department of Transport, Simon Lane, said the rail line through Footscray was close to capacity at its busiest peaks, making the system “increasingly unstable”. He said a maximum of 20 trains an hour could travel on the Footscray line, and at its busiest the system carried 17. To carry the projected number of passengers on V/Line-style trains would mean running 22 trains an hour. “Those sort of trains are not OK for fast, metropolitan use because it takes passengers too long to get off – we have a maximum stopping time of 30 seconds at each station,” he said. The trains used by Connex allowed faster passenger movement, Mr Lane said. Department of Transport director of rail projects Michelle Jackson explained the plan to the meeting, saying both Diggers Rest and Sunbury stations would be upgraded. A groan went up when 500 new parking places were announced for Diggers Rest. Ms Jackson promised double the number of weekday trains and about triple the number at weekends. Trains would start earlier and run later and also be more frequent. “Sunbury customers will also have full access to all metropolitan train stations along the route,” Ms Jackson promised. “We don’t want it,” came the rumble from the crowd. Ms Jackson said V/Line trains carried only half the number of passengers of metropolitan trains. She said the planned new service would take only three minutes longer to reach North Melbourne, and would offer passengers the benefit of going directly through the loop to Flinders Street station instead of only to Southern Cross. “Electrification provides a long-term solution that caters for the impact of population growth. “It will also provide Sunbury and Diggers Rest passengers with a quality transport service comparable to the rest of metropolitan Melbourne,” Ms Jackson said, to raucous laughter. A DAMNING report by the Victorian Auditor-General’s Office on the state’s main law to protect threatened species has found it “no longer provides an effective framework” for the conservation and protection of native flora and fauna. The findings vindicate environment groups, which have argued for nearly 20 years that the Flora and Fauna Guarantee Act has failed. The law aims to protect endangered plants and animals with action plans for their management and fines for their removal or destruction. A spokeswoman for the Department of Sustainability and Environment, which administers the act, said there were two fines imposed in 2008. The offences related to the taking of protected flora. 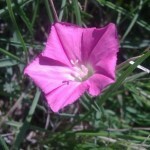 Riddells Creek Landcare member Russell Best said the act had many weak points, including failing to automatically protect rediscovered plants that had been considered extinct. Since the act was passed in 1988, 653 of more than 800 nominated plant and animal species, ecological communities and processes have been listed – about 37 listings a year – and many are also listed under Commonwealth legislation, which offers tougher protection. Many species in Melbourne’s west are listed because of cats and foxes and because much of their grasslands habitat has been lost to development. These species include the eastern barred bandicoot, striped legless lizard, grasslands earless dragon, growling grass frog, Australian grayling, golden sun moth. Plants include the small scurf-pea, matted flax-lily, Sunshine diuris orchid and clover glycine. To enforce the act, the Department of Sustainability and Environment received $4.9million in the 2008-09 state budget and $2.4million from the Federal Government. Staff working on the task were raised from six in 2004 to 12. Environment Minister Gavin Jennings commended the Auditor-General’s Office for its “frank and helpful appraisal”. “The [department] is reviewing the FFG Act and will soon provide advice on options for improvement. He has asked the department’s secretary to report back in 12 months.